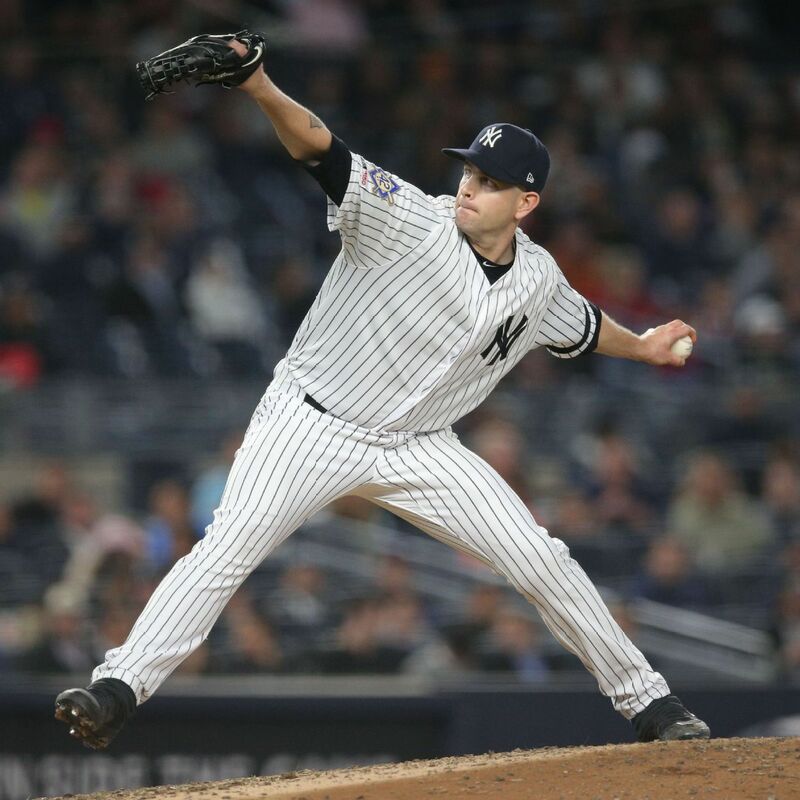 NEW YORK – Since he was in the minor leagues, James Paxton, whether he wins, loses or draws a no-decision, has done the exact same thing in the days after he makes a start. The left-handed pitcher's post-outing routine regularly includes long conversations with the dedicated sports psychologist he connected with years ago after signing with mega-agent Scott Boras. On the heels of a disappointing five- run, four-inning shelling at Houston last week, and with his first foray into the Yankees-Red Sox rivalry looming this week, the southpaw felt compelled in recent days to chat with the psychologist not once but twice. "It was big, "Paxton said. "Those conversations definitely helped." 2-strikeout two-hitter across eight masterful innings was evidence of just how much they did. Yankees first baseman Greg Bird was placed on the 10-day IL with a left plantar fascia tear, and manager Aaron Boone thinks the injury will keep him out "at least a month . " Luke Voit will start in Bird's absence. Making his rivalry debut, Paxton gave the battered, bruised and banged-up Yankees exactly what they needed Tuesday in an 8-0 win over the similarly scuffling Red Sox. Neither team is leading the American League East right now, but the Yankees hope a performance such as the one their entire team had in such a meaningful early season game might spark a run of some kind. "This is a big game for us, "Paxton said. "The rivalry really got the juices flowing, got the boys going, and everyone played well. Defense, we hit the ball really well, we were taking good at-bats, pitched well. Everything kind came together, and hopefully we can build off of this and get on a roll. " If the 7-9 Yankees begin rattling off wins, many of them might credit Paxton's stellar outing for getting it started.
" Paxton was unreal tonight, "left fielder Clint Frazier said. "He was confident From the get-go, he was out there throwing 100 [mph] And when you're doing that, it's going to be hard to hit a guy whenever his stuff's going like that.
" There's a reason he's here, and it's for moments like that. That's really impressive to go out and watch. " Officially, Paxton's four-seam fastball peaked at 99.2 mph. It was the 99.1 mph heater he threw to close out an 11-pitch, 1-2-3 first inning that helped convince the southpaw he was about to have a special night. Part of Paxton's conversations with his psychologist revolved around establishing himself as the aggressor as early as possible in Tuesday's start. That meant not just relying on his gas but leaning heavily upon it After two innings, 20 of the 26 pitches Paxton had thrown were four-seamers. "Everything comes off my fastball," Paxton said. "Because I was throwing hard, they had to cheat to it, and that allowed me to throw the breaking ball later in the game and get some chases on that because they were cheating to the fastball. When I'm throwing that fastball like that, everything plays off of it. " 2 Austin Romine noticed the life on Paxton's fastball early in the game.He decided to call it often. "Anytime you get someone throwing upper 90s – 98, 99 – that's a weapon that you've got to use , "Said Romine said. As good as Paxton's fastball was early, it was just as strong late, while facing four batters in a full eighth inning, he was still living in the upper registers of the 90s. at-bat against Mookie Betts to close out the eighth, Paxton's six four-seamers registered the following on the radar gun: 97.3, 97.1, 97.2, 98.5, 97.7 and 97.4. The 98.5 mph fastball came on Paxton's 108th pitch of the game. "I feel like he's settled in," manager Aaron Boone said. "I know he wanted to be a little more aggressive and pitch with more intent and confidence, and he went out there and did it himself and completely set the tone for the night just with his stuff and his pounding of the zone." Of the 110 pitches Paxton threw, 78 were 95.0 mph or faster. This was the 12th time in Paxton's seven-year career that he had 10 or more strikeouts in a game. His 12 strikeouts were the second-most in a game in his career, outpaced only by the 16 he had against Oakland last May. "That's what he's capable of when he has his really good stuff," Boone said. ] Paxton became the first Yankees pitcher to record an eight-inning, 12-strikeout game against the Red Sox since Sept. 2, 2001, when Hall of Famer Mike Mussina was perfect for 8 2/3 innings before Carl Everett reached with a base hit. Paxton also became the first pitcher in Yankees history to have 12 or more strikeouts and allow two or fewer hits versus the Red Sox and either iteration of Yankee Stadium. According to the Elias Sports Bureau, he's the first Yankees pitcher to have 10 or more strikeouts and allow no runs in a start against Boston. "It's a big deal because it's against Boston – especially being here – we want to beat Boston every time, "said Paxton, who had a 10-strikeout game against the Red Sox while pitching for Seattle two seasons ago. "It was a big start for me, just to get my feet under me and show myself that I can be here and do this." As Paxton prepared for this start, he watched video of his past outings against the Red Sox that came while he pitched for the Mariners. Something that stood out when he watched his July 2017 and June 2018 starts against Boston was the aggressiveness with which he pitched. He was driving his body toward home plate, generating momentum, and he wanted to replicate that. Paxton had already had one conversation with his psychologist about his mindset entering this start, but after seeing his old successful self, he wanted to reinforce what he saw. On Tuesday, hours before he took the mound, he had one final talk to be ready for the raucous environment that comes with Sox-Yankees in the Bronx. "Just to embrace it," Paxton said. "Go after it and be aggressive and enjoy the intensity of it."